Greetings everyone, this podcast recorded while in Indianapolis, Indiana. I’d like to share an article I wrote, published May 2013 in Occupational Health & Safety Magazine. It was titled, LIVE Our Own Health and Safety Advice. The published article can either be found on the magazine’s website or under Insights at www.ProActSafety.com. When my children turned three years old, their heads were exactly the height of much of the furniture in our home. Bruises and bumps abounded and we feared a call from Child Protective Services! We were tempted to tape bumper pads on the key head-knockers to reduce the suffering when we read a book that asked the question, “Are you preparing the path for the child or the child for the path?” We realized that even if we padded our home our children would visit other homes. How could we keep them safe in any environment? We discovered a behavioral precaution called “eyes on path” and our lives got better. In safety, we often face the dilemma of working on conditions or behaviors. The best safety solutions don’t ignore conditions or behaviors. The engineering hierarchy of controls defines how to start with conditional fixes and migrate to behavioral fixes for risks that cannot be eliminated or controlled adequately with conditional fixes. This approach can result in both a safer workplace and safer workers. Safe workplaces are stationary but workers are not. While we continuously improve workplace conditions, addressing safety behaviors can enhance workplace efforts and also take a road trip with the workers as they go to even more dangerous places, like home and highway. Make sure at least some of your safety efforts are portable. Terry L. Mathis is the founder and CEO of ProAct Safety, an international safety and performance excellence firm. He is known for his dynamic presentations in the fields of behavioral and cultural safety, leadership, and operational performance, and is a regular speaker at ASSE, NSC, and numerous company and industry conferences. EHS Today listed Terry as a Safety Guru in ‘The 50 People Who Most Influenced EHS’ in both 2010 and 2011. He has been a frequent contributor to industry magazines for over 15 years and is the coauthor of STEPS to Safety Culture Excellence, 2013, WILEY. 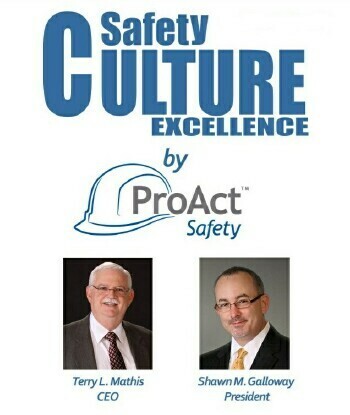 You can either watch the video here at www.SafetyCultureExcellence.com or you can watch it below from YouTube. Greetings, this podcast recorded while working in Toronto, Canada. This week I’d like to share an article I wrote that was published in June 2011 by Canadian Occupational Safety. It was titled, “Passionately Proactive: A Pleading Call To Action?” The article can either be found by visiting the magazine’s website at www.COS-MAG.com or under Insights at www.ProActSafety.com. We have received requests for older podcasts that are no longer available for download on this website. We are looking into why these old podcasts are not able to be accessed. It appears the application expires some of these once they reach a certain age. Even podcasts can have an age complex! Soon to address this, we will start making some of these older podcasts available through a small purchase that can cover our costs to provide them on a CD or memory stick and ship to your location.